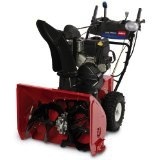 The Toro Power Max 1128 OXE Snow Blower is the top of range snow blower made by Toro. It makes models like the Toro 1800 Power Curve snowblower and Toro Power Max 1028 OXE snow thrower look very small indeed. The Toro 1128 OXE is powered by a Briggs and Stratton designed and built Snow series engine which as the name suggests was purposely built to be used in snow blowers only. This 4 stroke OHV engine has a displacement of 0.34 liters. This provide the machine with 11 hp which means that it really gives the auger and impeller massive amounts of power to get rid of snow. The fuel tank on the Toro Power Max 1128 OXE snow blower can hold up to 3.8 liters (1 US gallon) of fuel in it’s gas tank allowing it to work for hours before needing to be refueled. To start the Toro 1128 OXE you have a choice of either plugging it into the mains and using that to quickly start the motor at the touch or a button or you can use the pull cord to start it. The 1128 OXE uses a friction disk transmission that allows the wheels to turn independently, letting the machine make incredibly tight turns with ease. The clearing width of the machine is 0.71 m (28 inches). The tires on the Toro Power Max 1128 OXE snow thrower have a diameter of 0.38 m (15 inches) and a width of 0.13 m (5 inches) which offer a surface area wide enough to give very good grip to the machine even when it’s traveling uphill on icy ground. The Toro 1128 OXE is substantially heavier than any of Toro’s other snow throwing machines. It tips the scales at 114.8 kg (253 lbs) which may seem very heavy and hard to operate in a confined space, but thanks to it’s Freewheel Steering it’s actually very easy. Click Here to buy the Toro Power Max 1128 OXE Snow Blower.